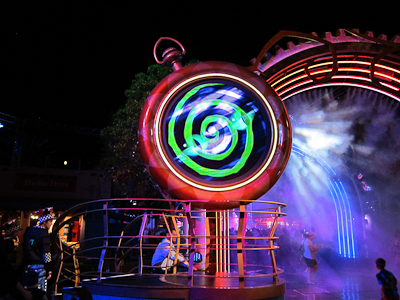 Have you ever walked around the Disneyland Resort and thought, “Man, I wish I could party like it’s 1999”? 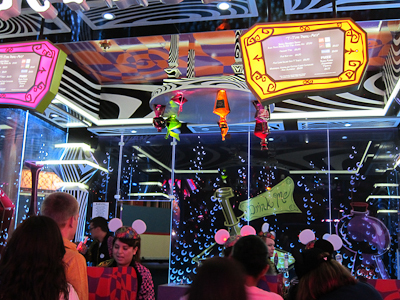 But what makes this part of the Mad T Party most like 1999 is the arcade. 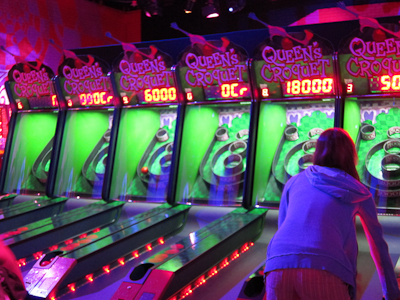 Once upon a time, I was very good at Skee-Ball, or as it’s known in Mad T Land, Queen’s Croquet. 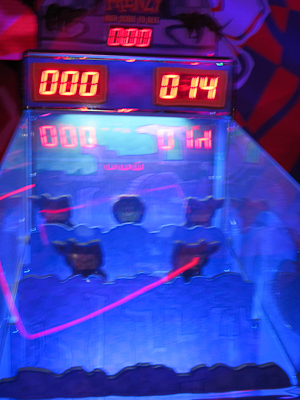 I’m still decent at it, but in my younger days, I was a Skee-Ball champion of epic proportions. Like many retired athletes, I peaked too soon. 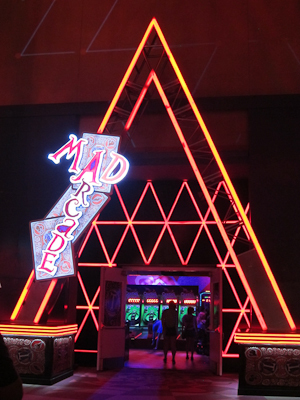 Anyway, the Mad Arcade is where you want to go when you love the vibe of the Mad T Party but are tired of dancing, or maybe you just have a bunch of quarters weighing you down with a need to play Skee-Ball and win nothing. The children’s writer in me wants to take a moment to point out that some of what the public has come to believe as a part of the original text of Alice in Wonderland (since I’m being really picky, properly-titled Alice’s Adventures in Wonderland) is really just Disney’s mishmash of the original book and its follow-up, Through the Looking-Glass (properly-titled Through The Looking-Glass and What Alice Found There) (told you I was picky). Jabberwocky is one of the things found in Looking-Glass but not in Wonderland. 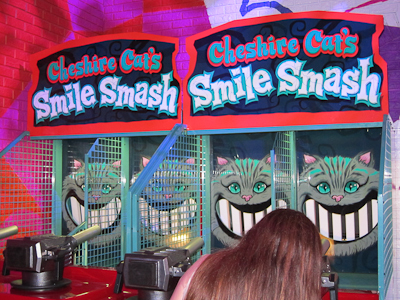 Most notably, Tweedle Dee and Tweedle Dum are also in Looking-Glass and not Wonderland. Incidentally, while I’m being snobbish, Tigger was a very minor character in the Winnie the Pooh series. In fact, he didn’t even show up until the second book. 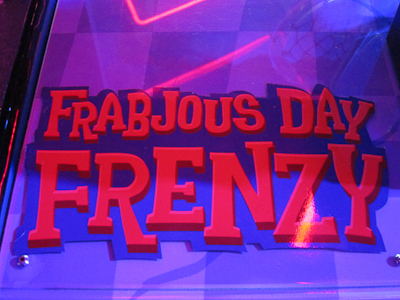 His Disney-elevated sense of importance remains a mild irritation to me. 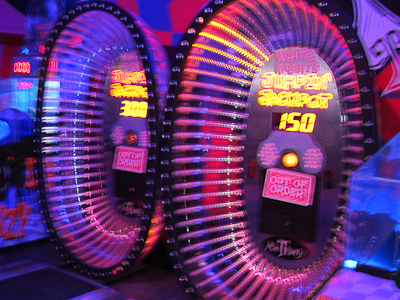 There’s also one of those electronic jump-roping games. I once had a co-worker who was INSANELY good at these. That, like, literally hurts my eyes looking at it. 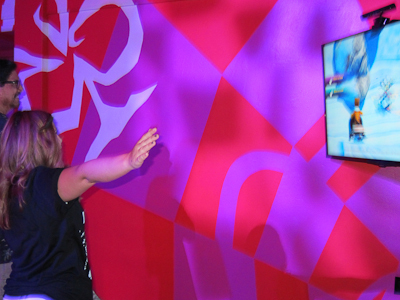 Did I mention you can also play Sony Kinect? 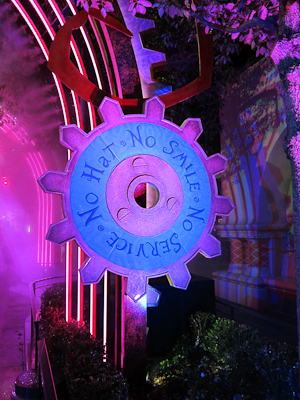 So that wraps up my 3-part series of the Mad T Party. 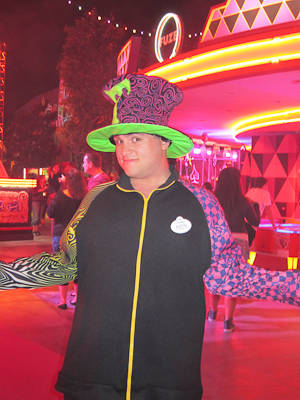 If you’re wondering about whether or not the Mad T Party is for you, here’s a handy quiz. 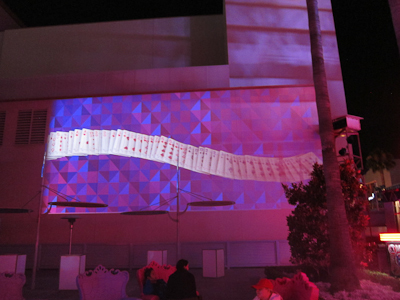 You’re in California Adventure and it’s night and you’re looking for something to do. You really, really like neon. REALLY like it. You love to dance and would love an excuse to dance except you’re old, like too old for clubbing, and all of your friends have gotten married except for the ones who aren’t going to throw big weddings anyway and when else do you get a chance to just dance? You wanna wanna wanna have fun fun fun! 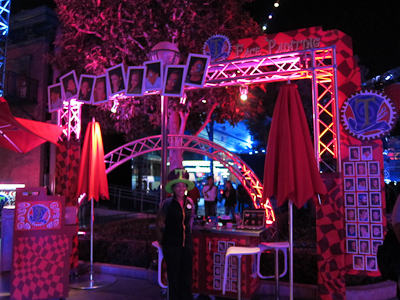 So over in CA Adventure there’s the Mad T Party, see part 1 here, a rockin’ dance party in Hollywood that lights up the night. I’ll admit I went in rather suspicious. I love Alice in Wonderland and this funked out version could have gone either way for me. I haven’t actually seen the whole latest Alice movie, the live action one. We were at a friend’s backyard movie night and Theo just hit his wall so we had to go home. But I totally digress. I like to throw in a picture when I’m getting off on a tangent. 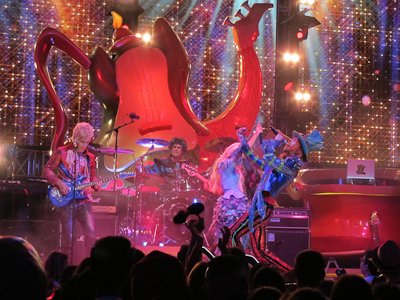 Anyway, Mad T Party is quite awesome. It’s got a very high energy vibe. 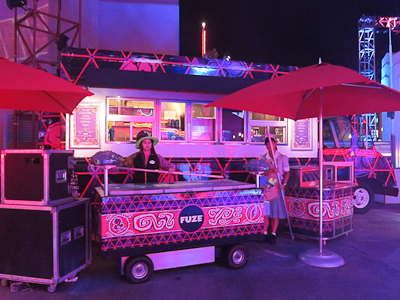 In the earlier entry I talked about the main stage with the live band, and the Drink Me bar. 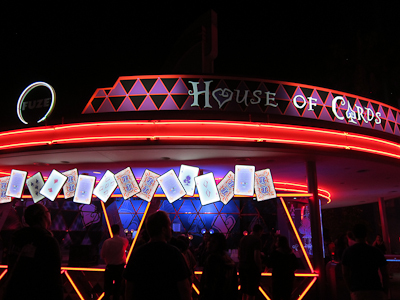 This time I’m hitting the smaller stage and other bar, the House of Cards. 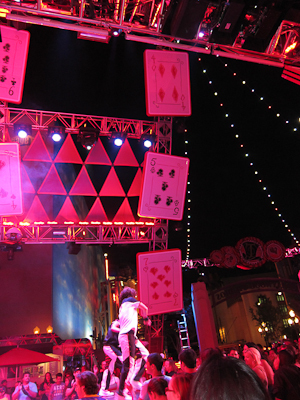 The House of Cards stage is front and center, and you can walk all the way around it. People dance there. 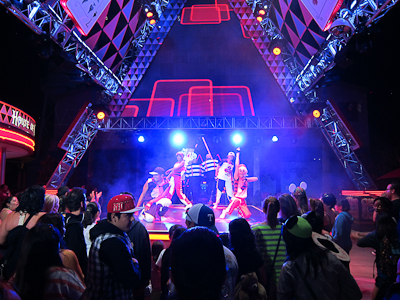 The dancers play to different parts of the stage. 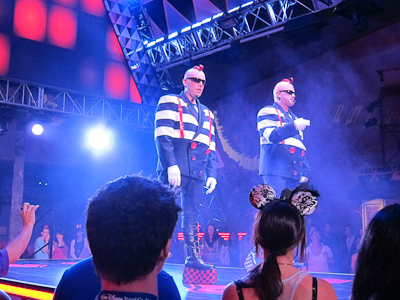 And the bouncers are Tweedle Dee and Tweedle Dum. 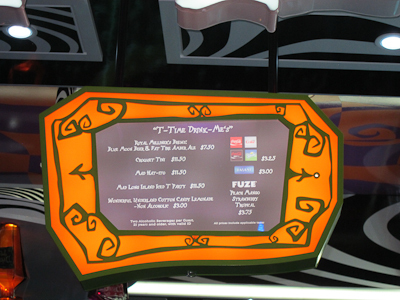 The House of Cards also has a bar with the same menu as Drink Me. 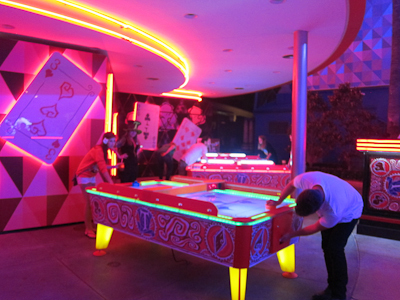 You can also play air hockey in this area, which reminds me of the number of quarters I dropped into the air hockey tables at the Starcade back in high school. Because I was awesome like that. 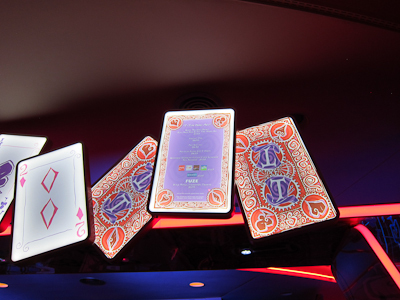 Not surprisingly, they did a great job carrying through the card theme of this house of cards. 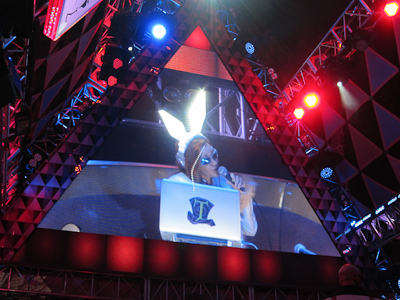 And once the dancers are done, they show a close-up of the white rabbit DJ over on the other stage. I just completely love this. I can’t really explain why. 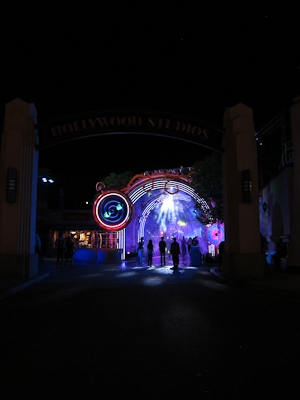 And if you’ve got a pair of Glow with the Show ears, they work here too! 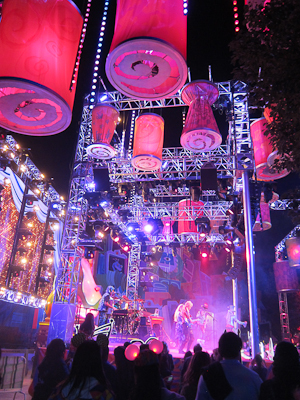 Over in Hollywood, or the Disney California Adventure version of Hollywood, there’s a dance extravaganza called the Mad T Party. 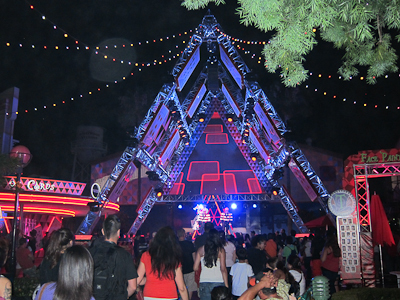 Prior to the Mad T Party, the extravaganza was ElecTRONica, based on the movie Tron, of course. 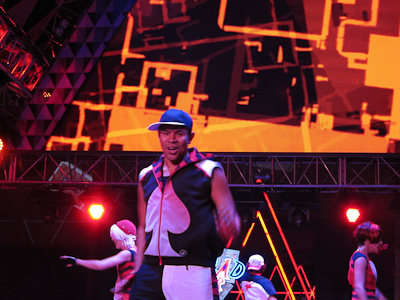 However, ElecTRONica got a little tired, so now it’s a really whacked out version of Alice in Wonderland, if Alice in Wonderland were some kind of Disney-based dance party thing. 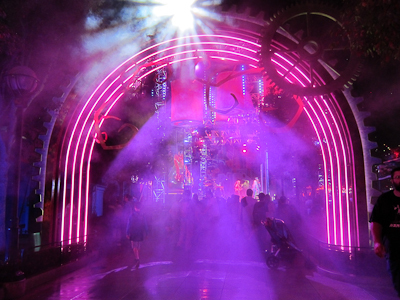 It’s all like glowy and flashy and very, very NEON. The White Rabbit’s stop watch, I presume. 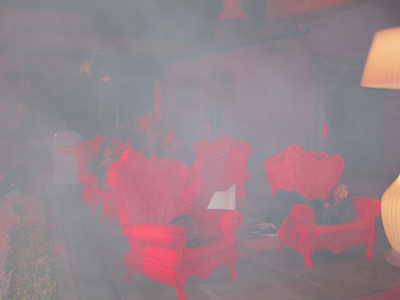 You walk through a cool misty thing, which is literally cool, as in kind of cold. Did I mention the neon? 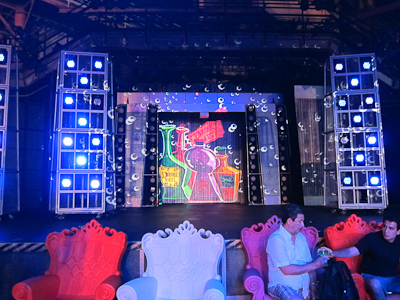 And that puts you right into the mood for the stage! It’s very large. And pink. 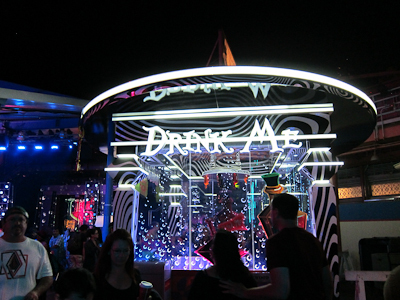 There are two bars, one of which is called (appropriately) Drink Me. It’s hard to tell where things start and end, which I suppose is the point. 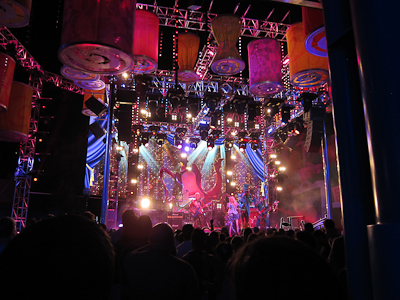 You can sit and watch the band in an oversized plastic chair in front of a decorative screen that used to be a show in ElecTRONica. 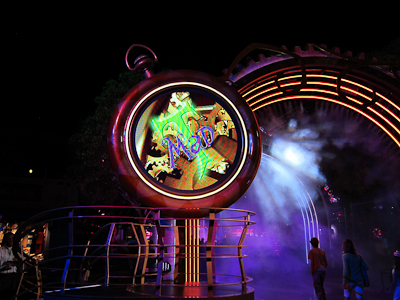 I personally like the Mad T stage better. 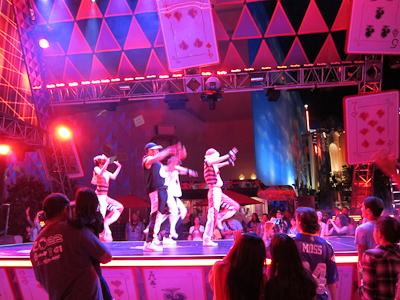 And the stage and band, of course, are a highlight. 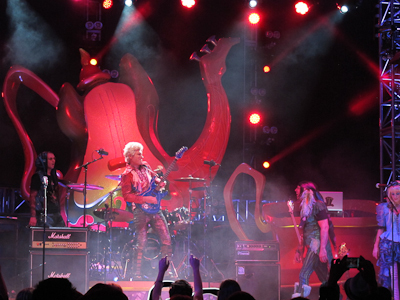 It’s Alice and all of her friends, except dressed in funky neon rocker clothes. 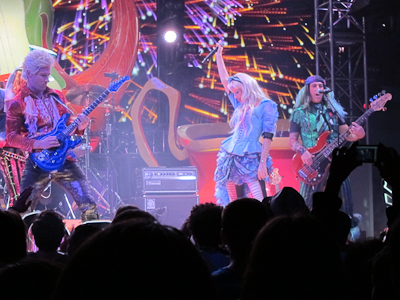 They play a bunch of covers from the last few decades, which is lots of fun. No Disney music here. Feel free to dance along!